I bought an apartment in October. You can imagine the joy at the thought that it'd be my future family's home, terror at the sight of the mortgage value on the signed contract, and all the excitement about getting to set up a house from scratch. 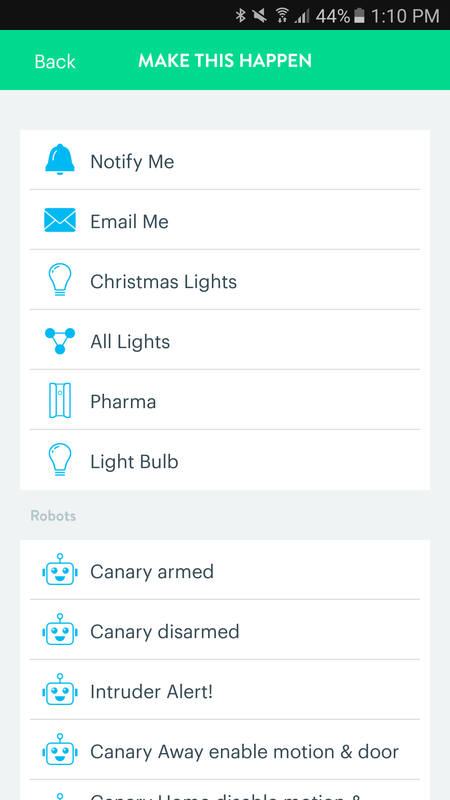 I could pick everything that I loved from design to materials to colors to organization, and yes, also automation. I wanted lights that turn on when the doors open, A/C units that cool the place when I'm coming home and the outside heat is too much to bear, cameras that catch intruders the moment they are detected, a washing machine that notifies me when the load is done, colored lights that coordinate with whatever I'm watching on TV, blinds that open and close with the sunset and sunrise, and much more. But soon into my research, I hit a wall, then another wall, followed by even more walls. Metaphoric walls, mind you, because hitting my apartment's walls would be very damaging and expensive. Despite the promise and allure of smart homes, despite us hearing about them for years now, despite what seems to be a huge collection of IoT devices on the market, and despite everything we own becoming smart in some form or another, home automation is still in its infancy. Nay, its fetal state. 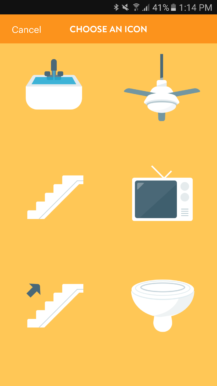 Putting aside the issues with security which everyone is still trying to figure out, there are so many problems that home automation has to overcome before it becomes as prevalent as we would like it to be: ease of use for the non-techies in your life, interoperability between different devices, affordable prices, and most importantly protocols. There's Bluetooth (and its many variants and sub-protocols), WiFi, ZigBee, and at least two different Z-Wave frequencies for North America (908.42 MHz) and Europe (868.42 MHz). 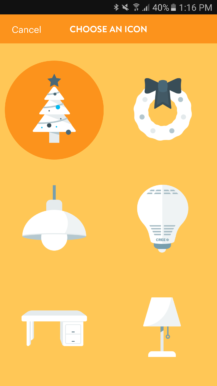 When you factor in the different voltages between countries, plug types, light fixture sizes and shapes, and lamp screw types, you're looking at soooooo many things that need to be compatible for just one product to work in your house. Ouch. If you live in the USA, you have it easy... kinda. Plenty of companies are US-based and are building products that simply work there. 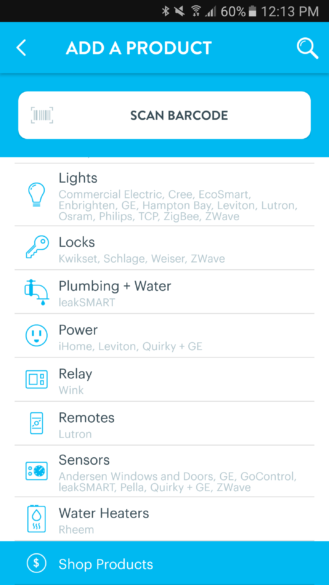 If you live in Europe or somewhere else, your home automation life is going to be a lot more complicated. Each product you look at will have to go through rigorous research to make sure it is compatible with what your country uses, and odds are that you will find a limited selection of products that do fit the bill. After realizing the limitations with home automation, I lowered my expectations, then lowered them again. 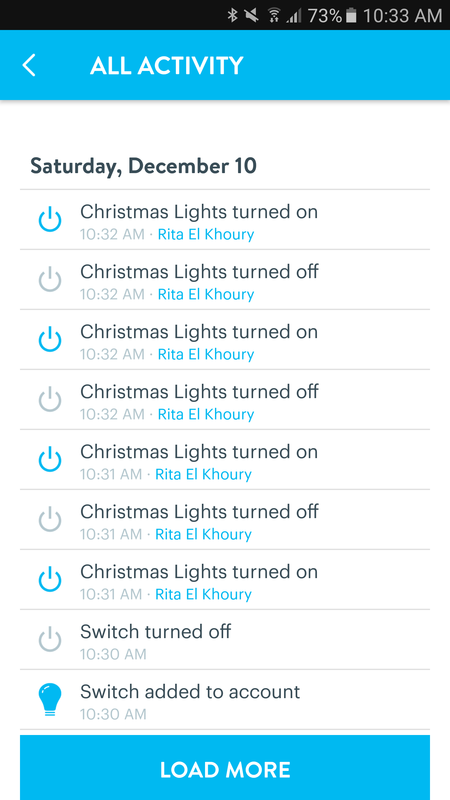 I didn't want anything that was permanently affixed in my house because technology changes very quickly, nor any indispensable product that doesn't work without power or connectivity (both are finicky in Lebanon), nor anything that demands modifications to the walls or ceilings or house wiring, and whenever possible, I wanted products that didn't require their own hub because who has 20 Ethernet ports on their router? Plus, whatever I bought would have to work with as many other products as possible. 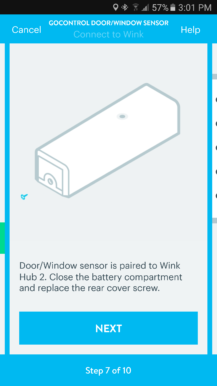 It's about that time in my research that the Wink Hub 2 was announced. 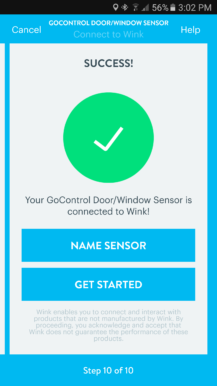 The number of connectivity protocols was appealing, especially the upcoming Thread (Bluetooth) support, and the Wink website felt inviting and clear. 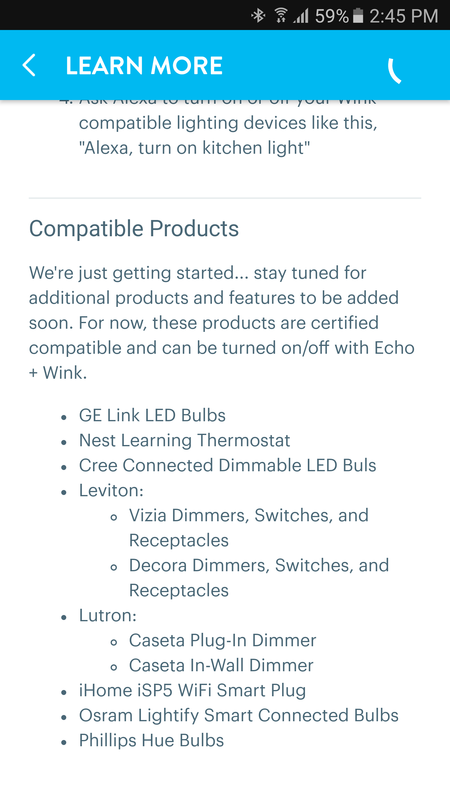 Supported products are neatly laid out and the requirements for each (eg GE Link bulb page) are so clearly labeled with superbly detailed support pages (eg GE Link support page) that it made things a lot easier to parse and understand. So I jumped on the chance to review the Wink Hub 2, despite the fact that it supports Z-Wave at the North American 908.42 MHz frequency. 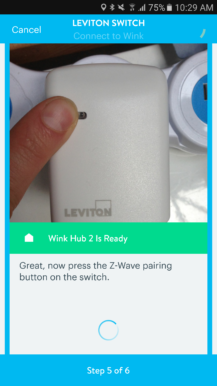 I knew this would make finding compatible Z-Wave products that operate at 220V (voltage in Lebanon) almost impossible, but I liked the challenge. The Cree bulb and Leviton plug pictured at the top, for example, only work at 110V and are useless for me. The GoControl sensor suite, however, uses batteries and thus caused me no issues. I thought the GE Link bulbs would work at 220V but they didn't. I had more success with the Aeon Labs ZW096 smart switch, which supports Z-Wave 908.42 MHz, both 110V and 220V, and only needs a US-EU plug to work with my appliances. Add a Canary camera (read my full review) and an Amazon Echo Dot 2nd gen (read my full review) and I was ready to get started. 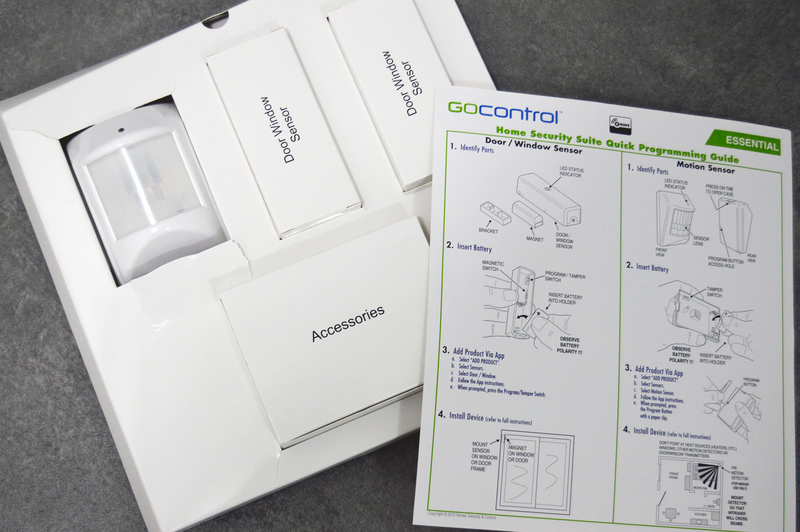 The GoControl sensors use batteries for power and don't require specific voltage. 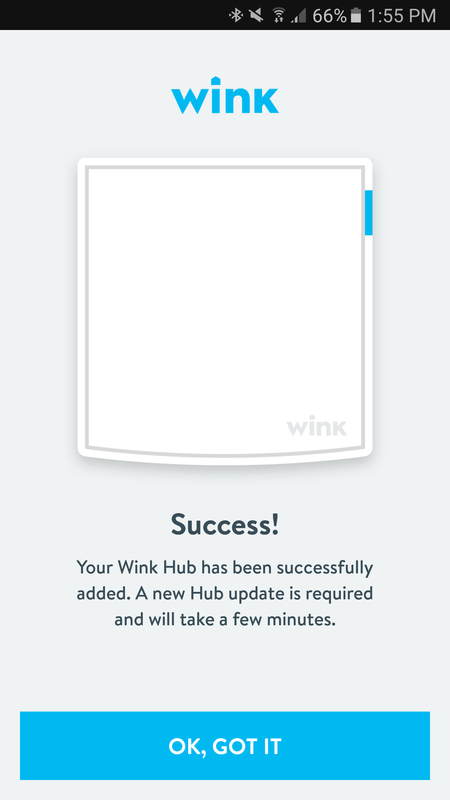 With that long introduction out of the way, my Wink tests could begin. 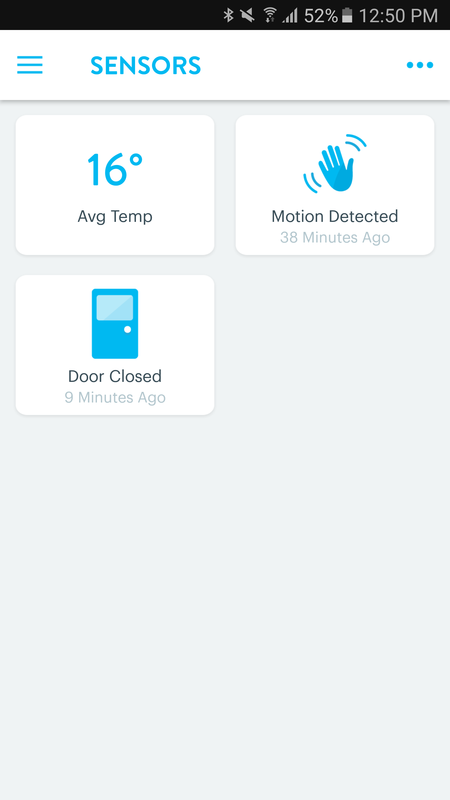 Since my apartment is not done yet, I installed the Hub 2 with the Canary, the three GoControl sensors (two door and one PIR motion), Echo Dot, and Aeon Labs in the workplace: my pharmacy. I dabbled with different settings and options, then quickly figured a few that improved my day-to-day life and the pharmacy's security. I've been using the Hub 2 for almost two months with this setup, and its performance has been solid throughout despite the frequent power cuts and the spotty internet connection here. Grab a cup of coffee and get ready to read my full detailed review. Dimensions 7.25" x 7.25" x 1.25"
WiFi or Ethernet Connect the Hub 2 to your router directly via Ethernet or place it anywhere else in the house thanks to WiFi connectivity. Simple setup It took about 2 minutes to get the Hub 2 up and running. 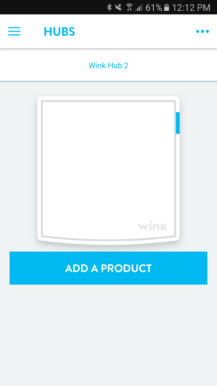 Guided product integrations The Wink app has guided tutorials for every product you're adding to your system. It's near fool-proof. 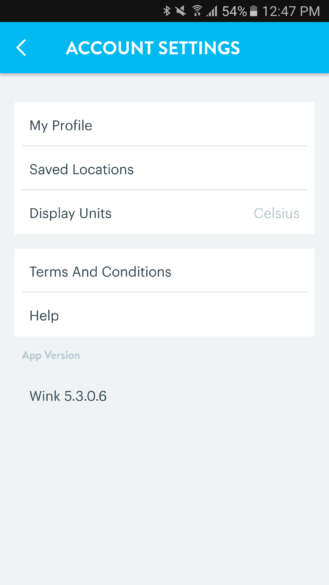 Excellent Android app Beside all the tutorials, the Wink app is reliable, super powerful, well organized, and works on Android Wear. 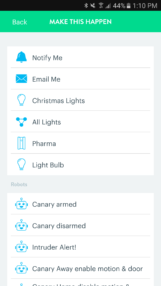 Different automation methods Schedules, Shortcuts for iFTTT and Alexa, Robots, there are plenty of ways to make things work your way. Local robot execution Unlike the first gen Wink, Hub 2 can execute robots locally without talking to the servers, causing much less delay and almost instantaneous responses. 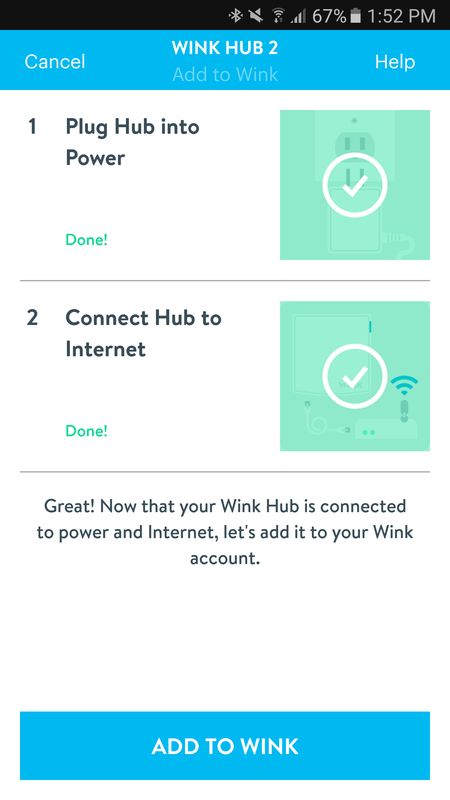 Solid performance Based on my personal experience: I didn't have a single issue in over two months with the Wink Hub 2. 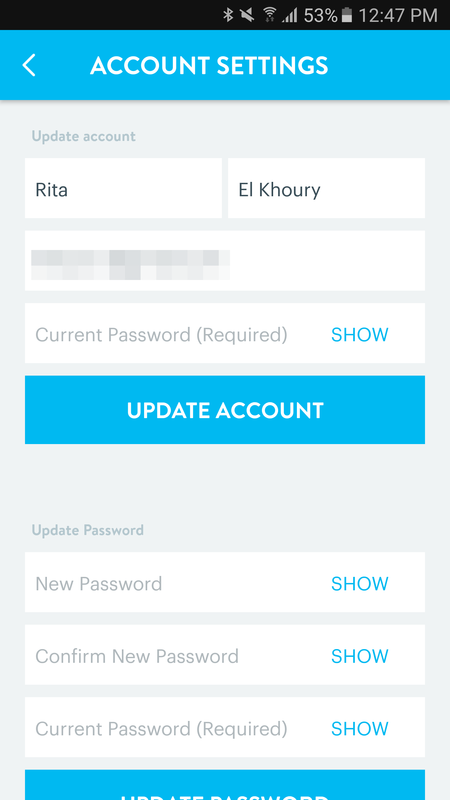 No easy multi-user setup You have to grant access to other users for each device you add, individually. 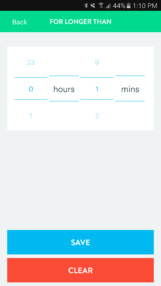 Confusing at first The Wink app is overwhelming at first and understanding how to do something takes a bit of time. 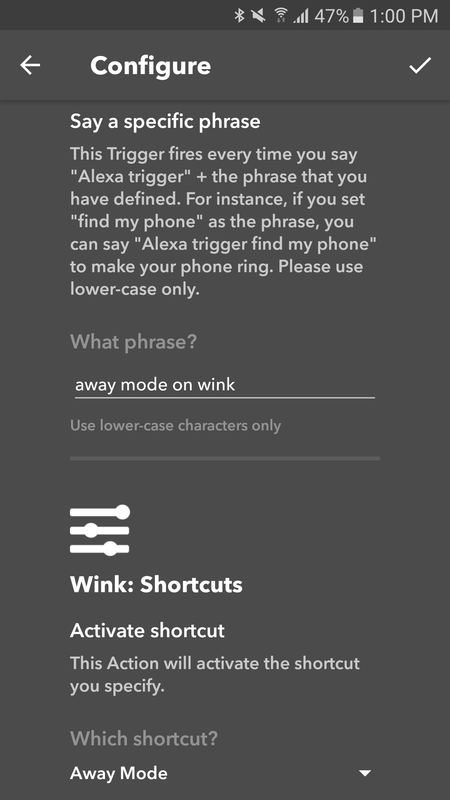 Limited Google Assistant, Alexa, and IFTTT integrations Wink only gives them access to its Shortcuts, acting as an action but never as a trigger for any outside automations. 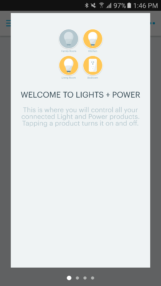 Only works with supported products Unlike SmartThings, users can't create their own integrations. 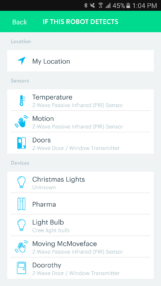 You're limited to what is officially supported plus a few odd generic Z-Wave and ZigBee products. 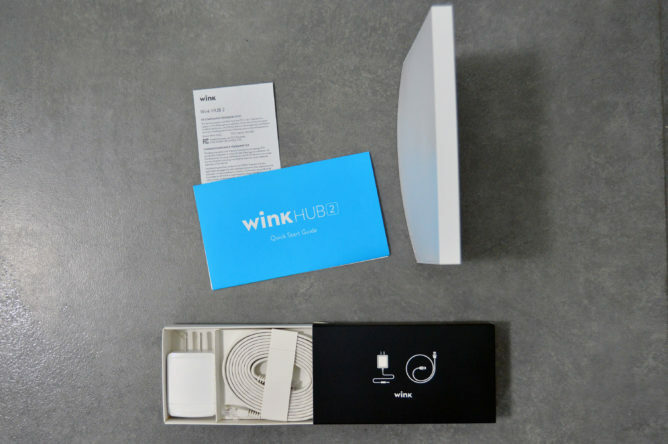 The Wink Hub 2's hardware is not the star of the show, but we'll take a quick look at it nevertheless. 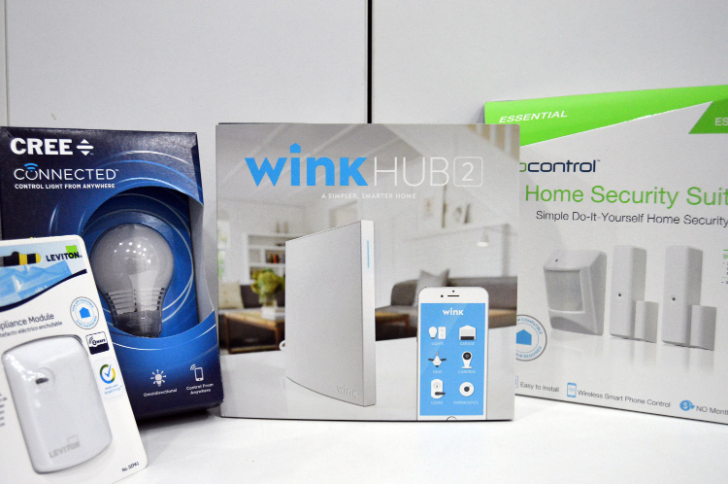 In the box, you'll find the Hub 2, a couple of manuals, a power adapter and cable, and an Ethernet cable. 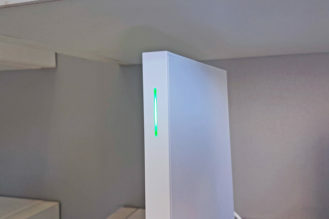 The Hub 2 has a vertical tower shape with a thin top and a little wider bottom. It's white, with elegant and clean-looking edges, and inconspicuous enough to hide in any decor. 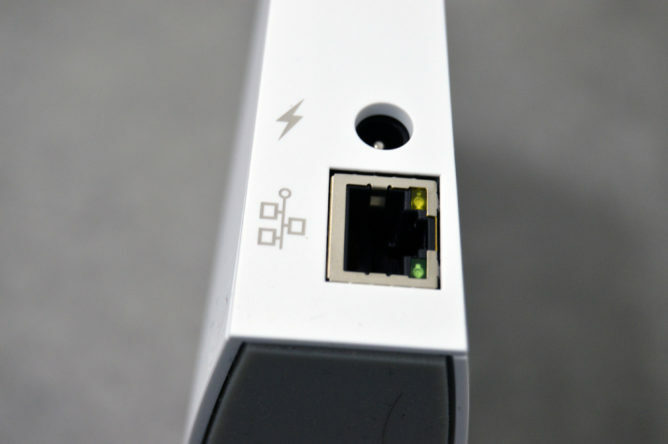 The only two ports on the Hub 2 are at the back: Ethernet and power. 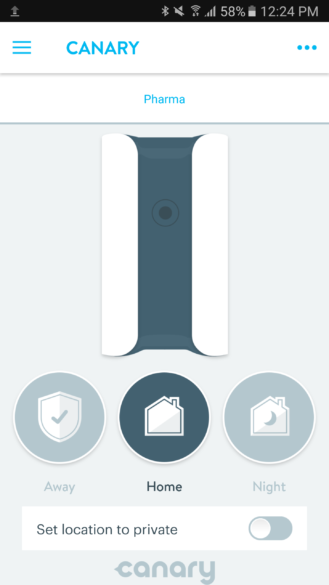 The smarts are all in the wireless antennas built into the Hub. 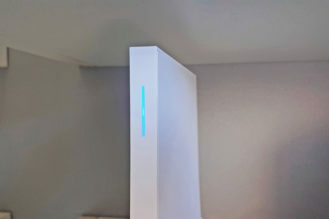 The Wink Hub 2's light subtly changes from blue to green when it detects an event. 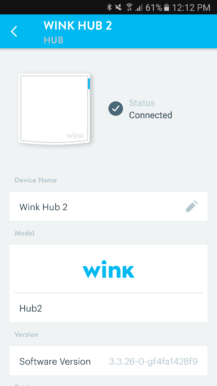 And that's really all there is to the hardware side of the Wink Hub 2. The magic happens on the inside and through the application. 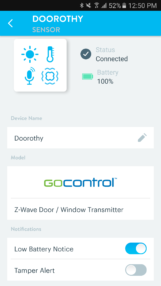 In all my years of testing and reviewing accessories, gadgets, and various electronics, I have never run across a device that has such a well thought-out integration with others. This is by far my favorite feature of the Wink Hub 2 and why I could easily recommend it to those who want to dabble into home automation but aren't keen on tinkering with things beyond a regular setup. 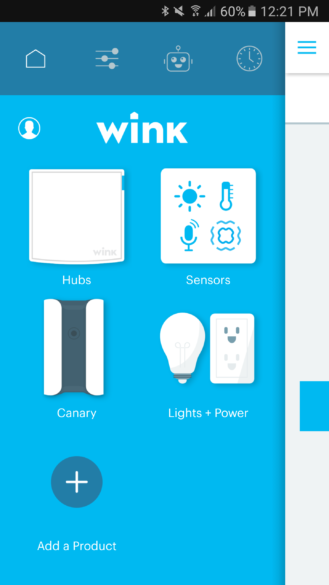 Every product that is officially supported by Wink has its own page on the Wink website with a description of its features, specs, and requirements (eg. 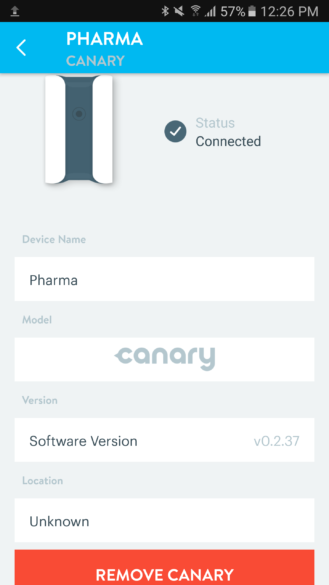 Canary description) and a support page with FAQs, setup process, and contact number (eg. 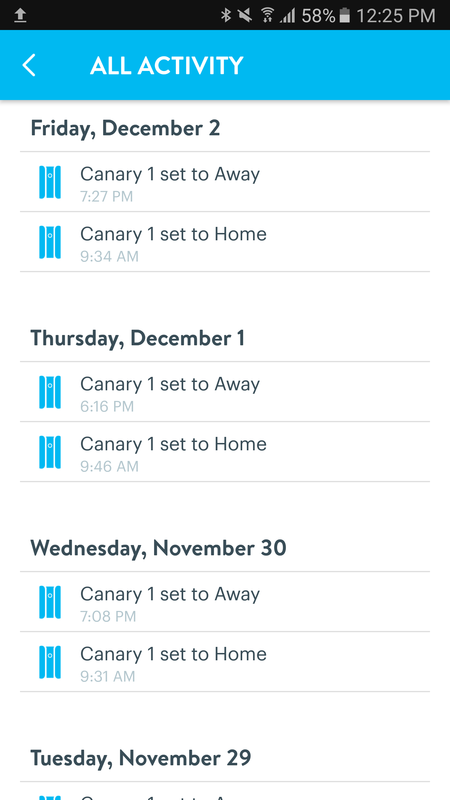 Canary support). 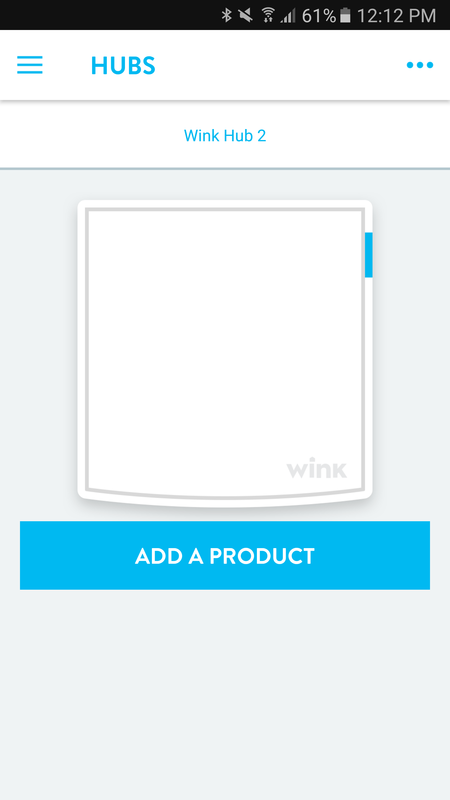 Then every product you decide to add in the Wink app comes with its own step-by-step tutorial showing pictures of the actual product and some graphs when necessary. It's all near fool-proof and easy to figure out without digging up any huge manuals or spending hours online trying to find how exactly to make things work. 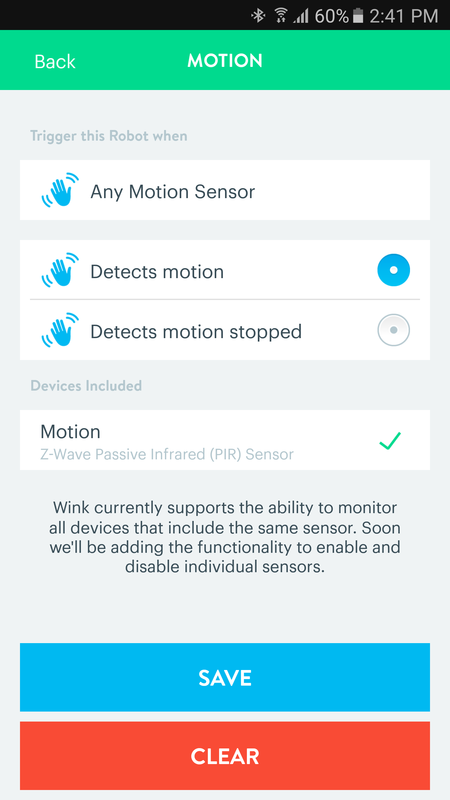 Wink has gone out of its way to make the process painless and none of the devices that I added took more than 2 minutes each to set up. 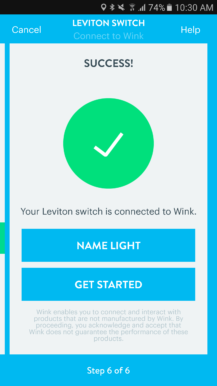 I only had to look up info on the Aeon Labs switch because it's not officially supported - I found out I could just add it as a Leviton switch. 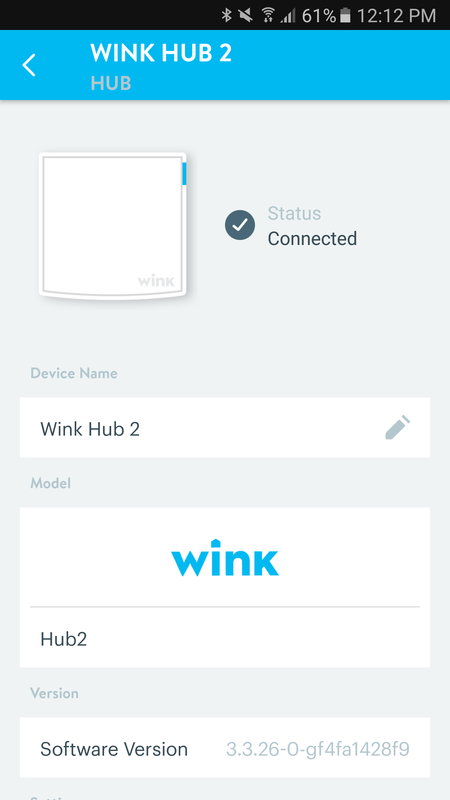 The first device you have to add to the Wink app is the Hub 2. 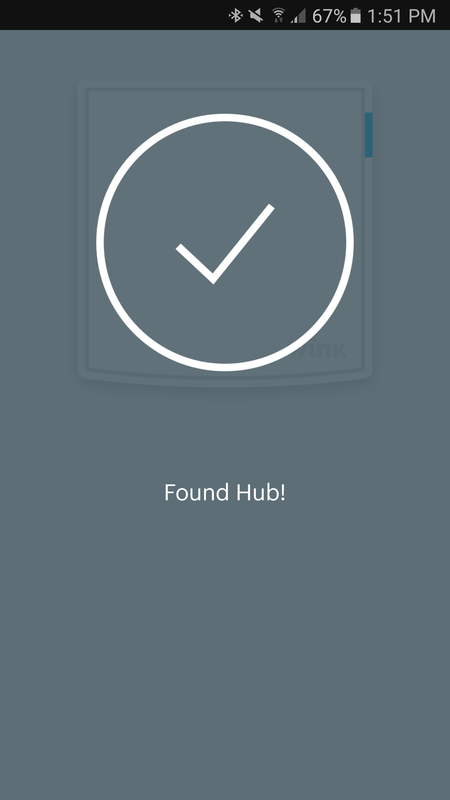 After choosing it among the different hubs, you plug it in, let the app discover it, introduce it to your WiFi network (or connect it via Ethernet), give it a name, and you're done. 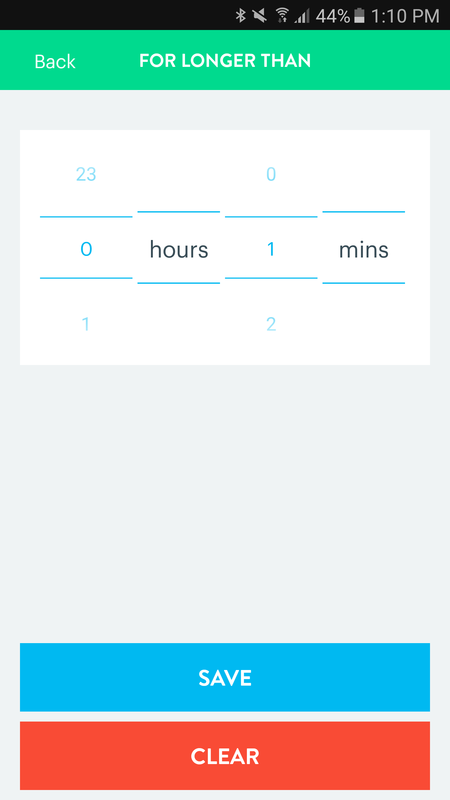 It takes 2 to 3 minutes and a couple of screen taps. 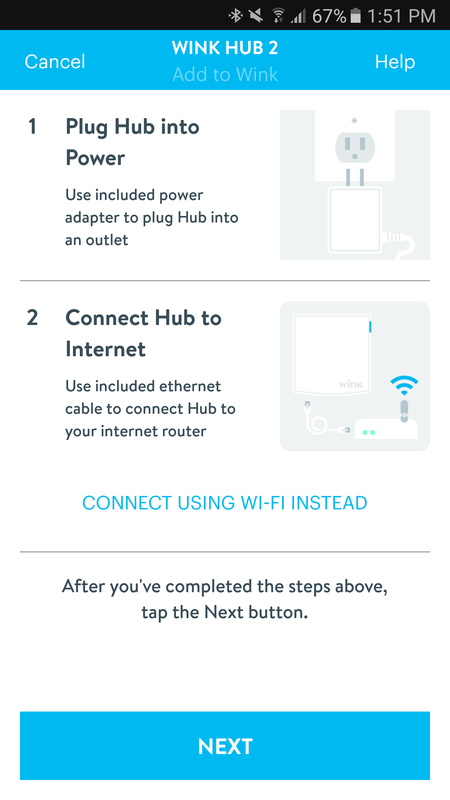 Once your hub is all set, you can start adding other devices to your system. 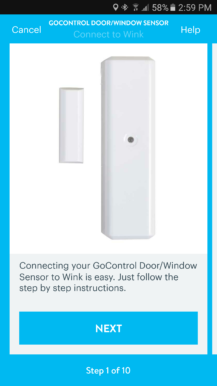 The Wink app has a detailed list divided by categories, with a search function and a handy barcode scanning option in case you prefer to be sure you're adding the right item. After selecting the exact device you're setting up, you get to the detailed tutorials I mentioned above, with multiple steps that you can easily follow along for a painless setup. 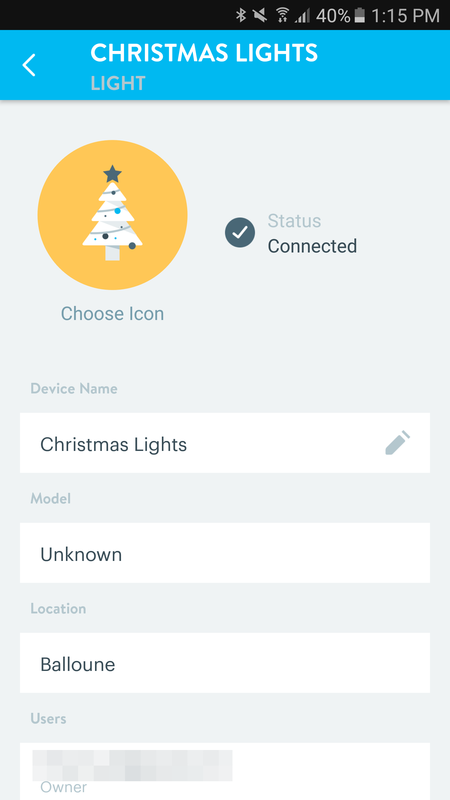 Once you're done, you can rename any device you add. 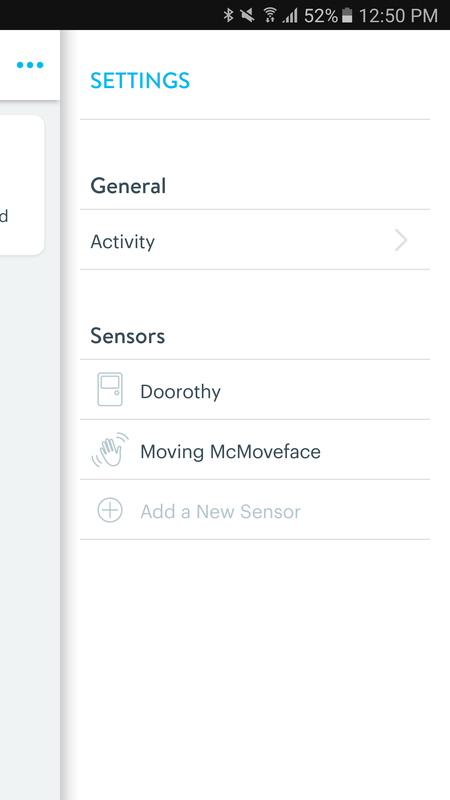 My motion sensor is Moving McMoveface for example, and one of my door sensors is Doorothy. I... got carried away. Above: Setting up the GoControl motion sensor. 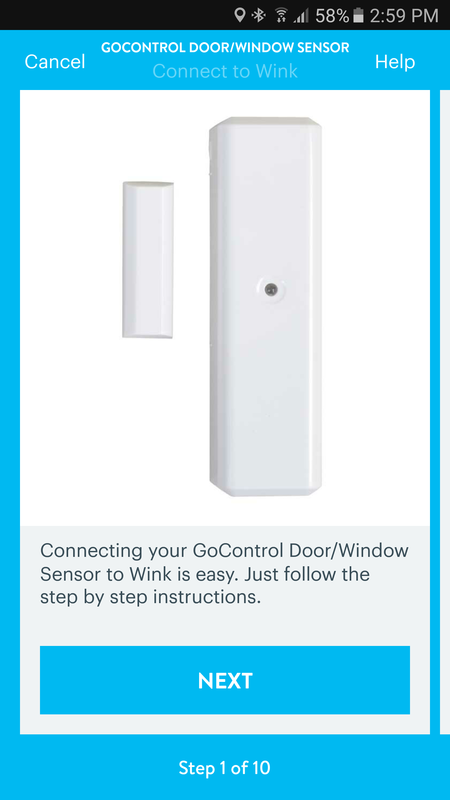 Above: Setting up the GoControl door sensor. 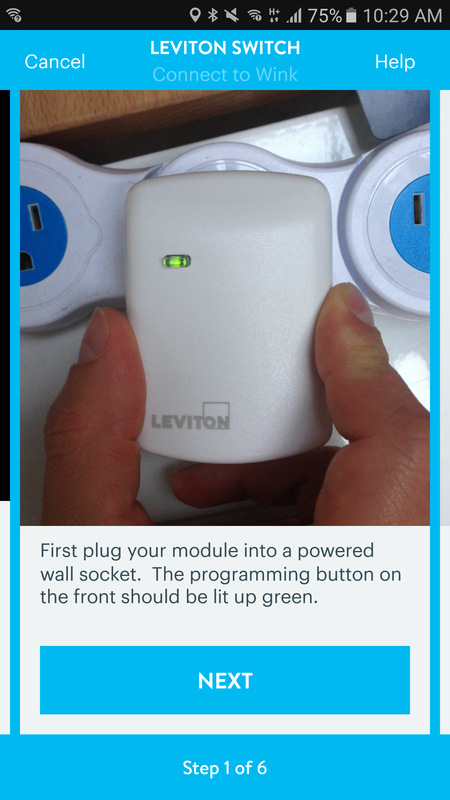 Above: Setting up the Aeon Labs switch... as a Leviton switch. 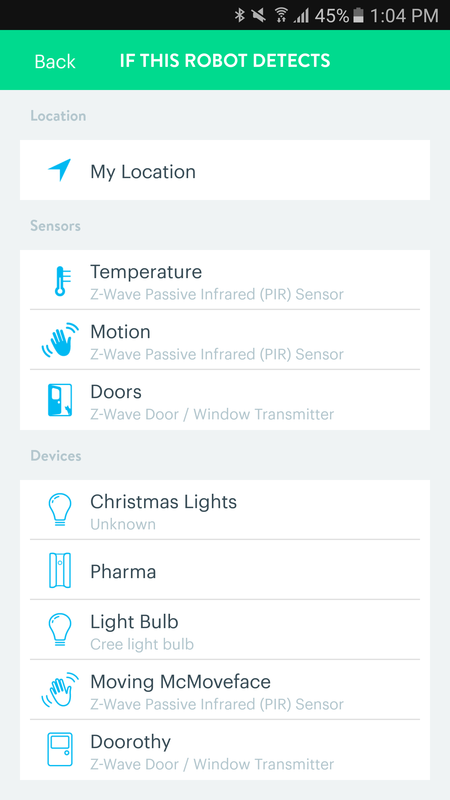 It's Z-Wave and it just works! 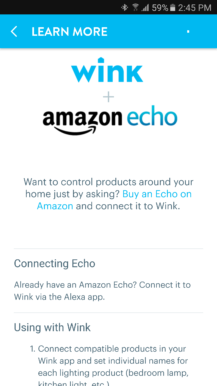 Above: Setting up the Amazon Echo... or not. 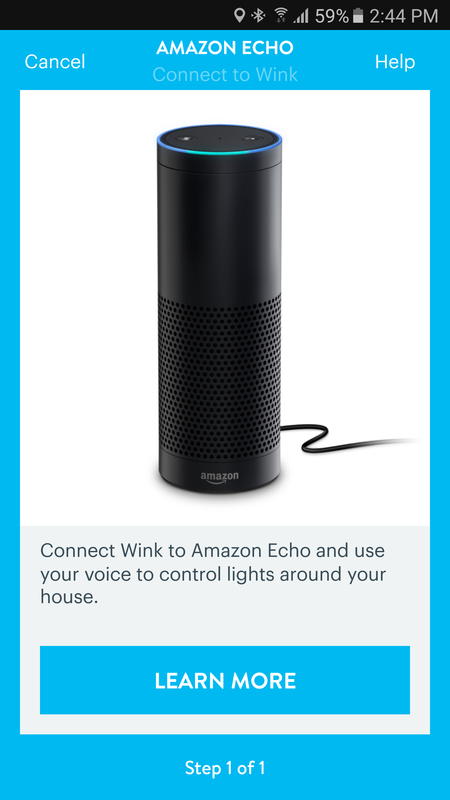 The only device that doesn't really get set up like the rest is the Amazon Echo family. The Wink app only has a one-step tutorial page that explains that you should link your Wink from the Alexa app and not the other way around. And it only supports a small list of products (bulbs, dimmers, plugs, and Nest). After adding Wink to the Alexa app, you can turn these on or off with voice commands. 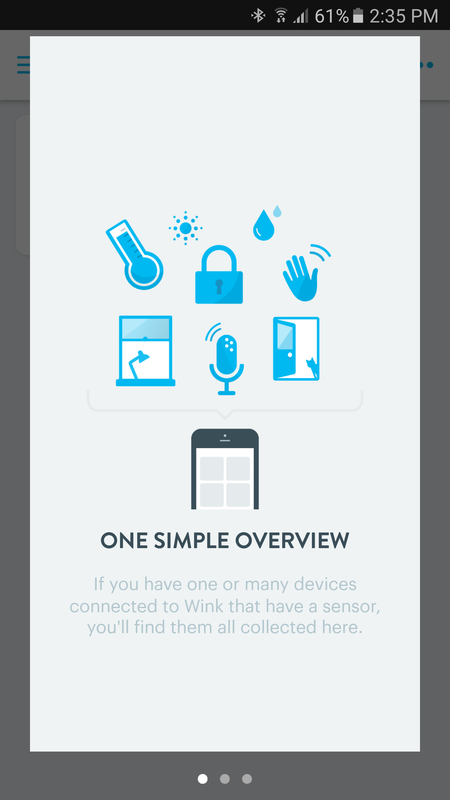 Some of the devices you add to your Wink app will unlock special sections in the app. Lights + Power and Sensors are two of the ones I ran into. All lights and switches and plugs get bundled up in the first and all sensors in the second, so as not to clog your app with each individual item. The first time these sections open up, you get nice on-screen tutorials, further simplifying the experience. Home is where all your devices reside, including the Hubs, Sensors, Lights + Power, and more. 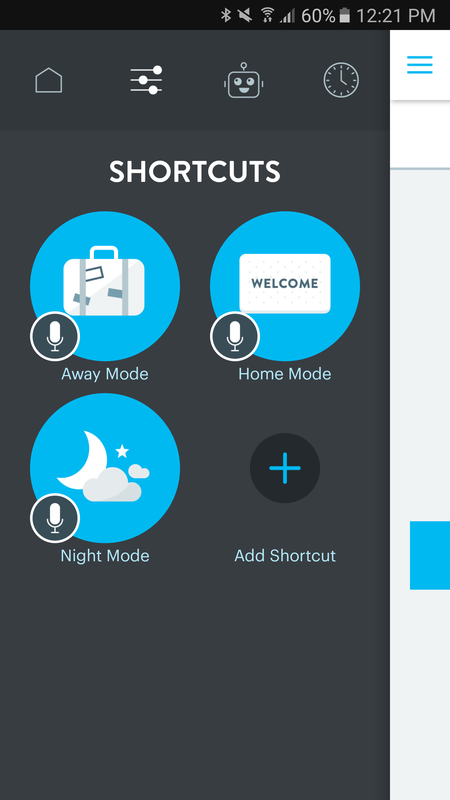 Shortcuts are manual mode switches you can create to quickly launch your home into a night scene or away scene. We'll further discuss them later. Robots are the heart of Wink's system, letting you create automatic actions based on any trigger. Also to be discussed later. Activity is where you can monitor every event that is recorded, manually executed, or automatically triggered by your Wink, like doors opening, lights toggling, mode switches, robots being activated, and more. 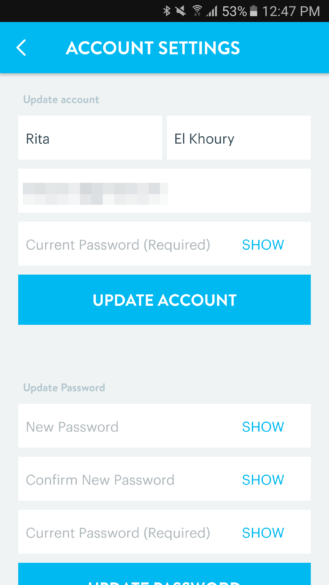 The Home tab also houses a small user icon that lets you access your account settings. These are limited to your name, email, password, saved locations, and preferred units. 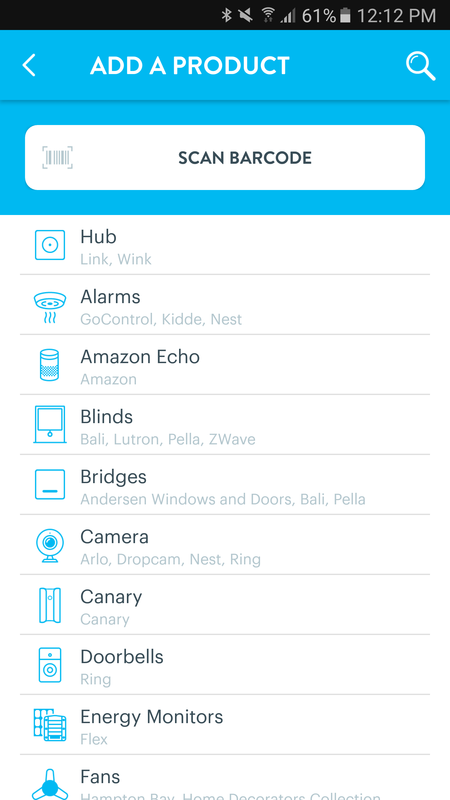 All the settings are more tied to the devices you add to Wink and not your user account per se. One thing I have to note though here is that no matter how many times I set my display units to Celsius, they kept going back to Fahrenheit a few days later. I'm not sure why. 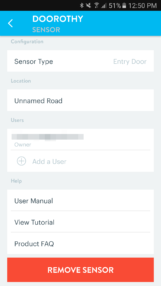 User settings are pretty basic. 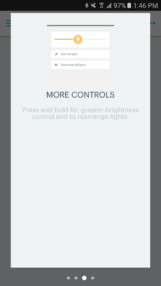 Once you choose any device in the Home tab, your main screen switches to display that front and center. 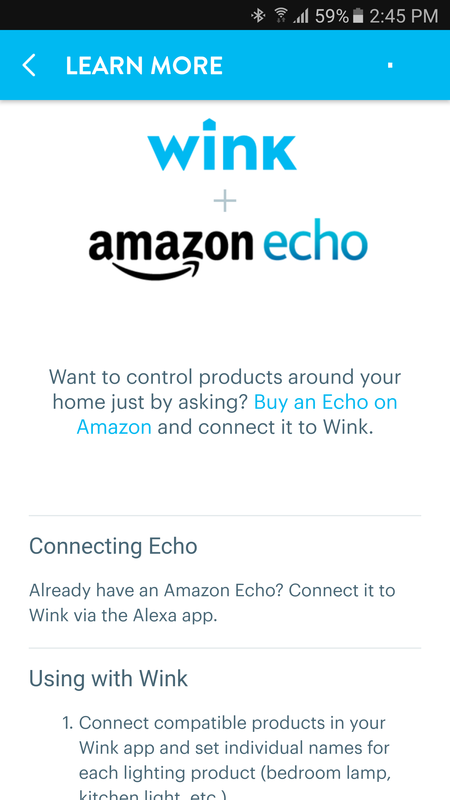 All devices on the Wink app follow a similar layout: main page for the device and whatever executable options you can perform right now + overflow menu that slides a page from the right with access to the device's activity, schedules, and settings. 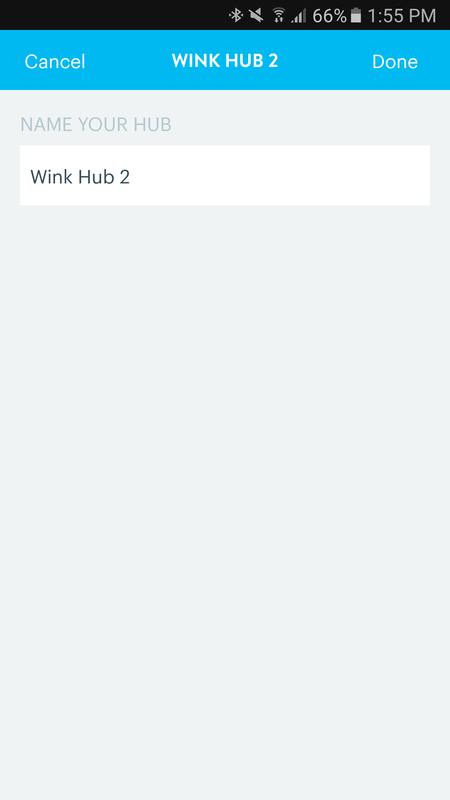 Since you can't really do something with the hub, the Wink Hub 2 only gives you an option to add a device to the system. In its settings, you can rename it, check for software updates, assign it to a location, add other users to control it, and access some support documents for it. 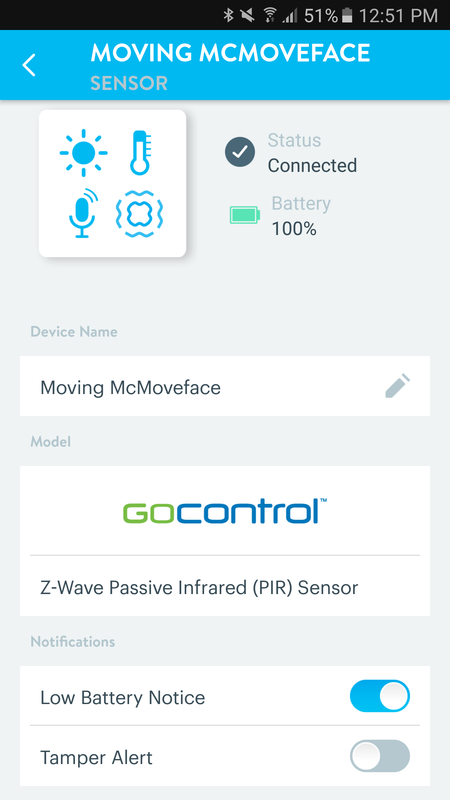 There are also settings for WiFi and Z-Wave controls (network rediscovery, resetting Z-Wave, learning mode, inclusion mode, exclusion mode, and shift controller). Unless you're having issues with your system, I can't imagine you spending any time in this section of the app. 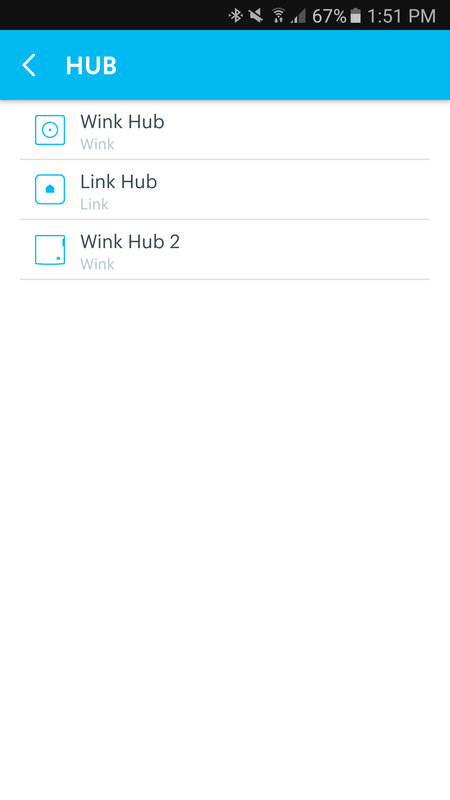 Wink Hub 2 product main page (left) and settings (middle and right). Part of the Wink's charm is that it personalizes the third-party device integrations so well. 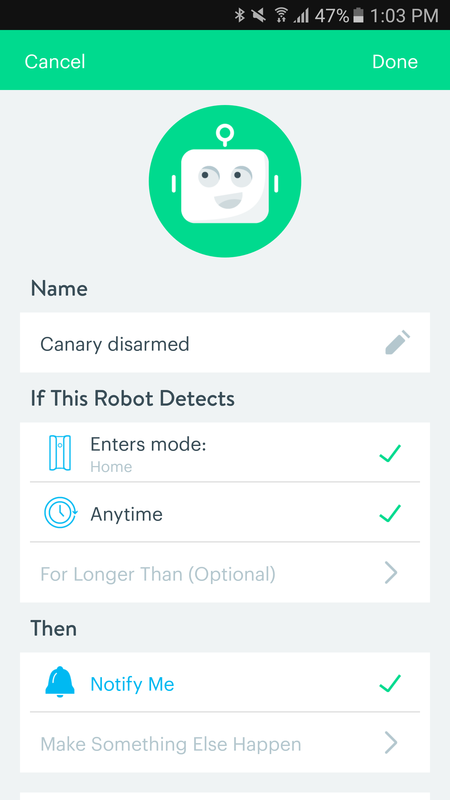 The Canary product page for example shows a graphic of a Canary camera, not a generic cam, with buttons to quickly switch your cam to Away, Home, and Night modes, and toggle privacy. 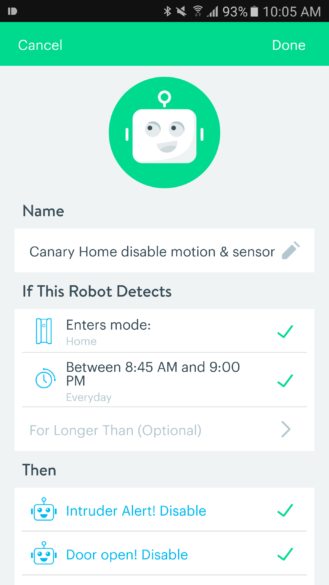 The settings are limited here, you can just rename your Canary and assign it to a location. 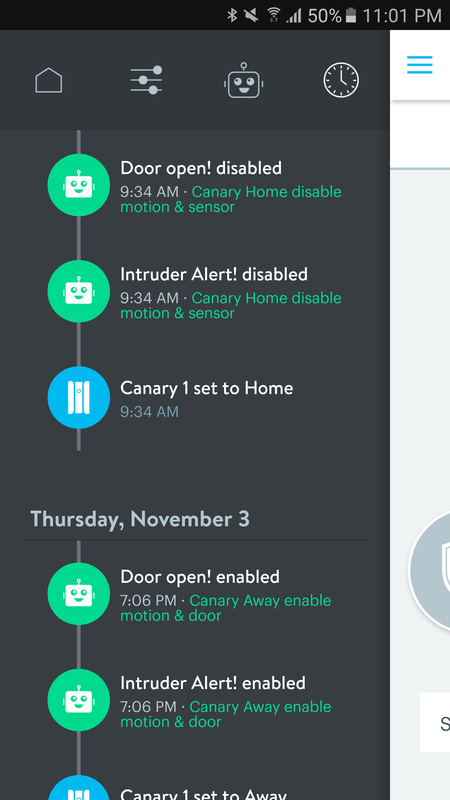 Canary's right side menu lets you access the camera's activity, where you can see each time the cam's mode switches, and its schedule where you can manually set it to change from home to away at a specific time. 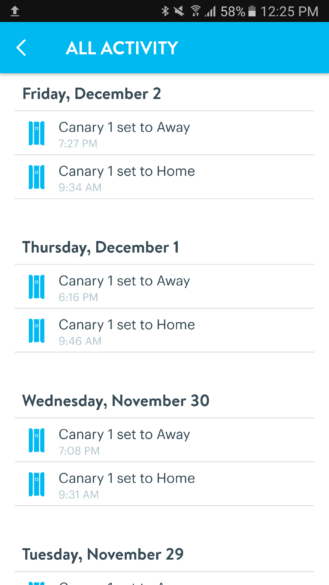 This scheduling function isn't available in the Canary app at all - the automatic changes there happen based on your phone's geofence - so it's nice to see a workaround way to implement it through Wink. 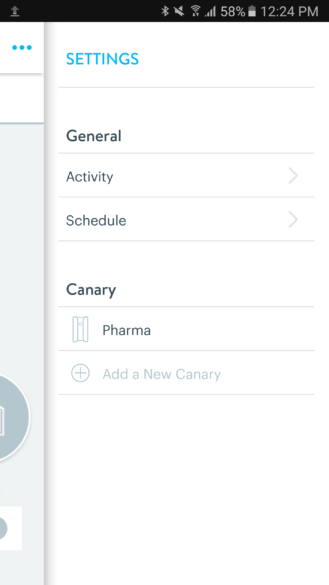 Canary's menu (left) and Activity (right). Dec 1: Oops, seems I was late to arrive and early to leave. 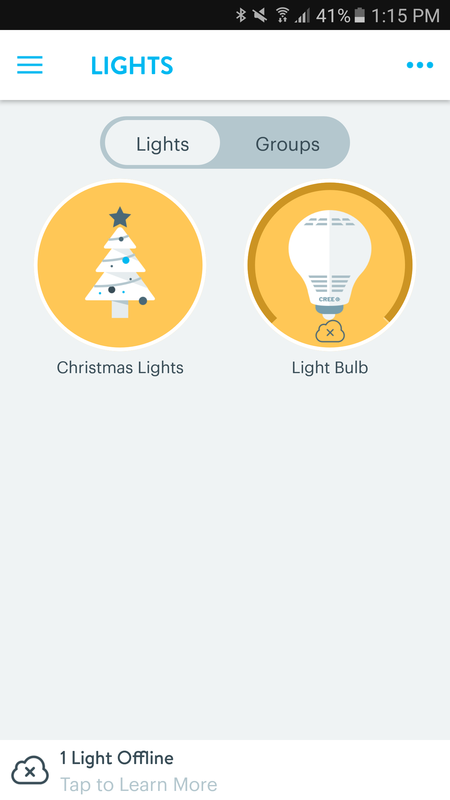 All of your lamps, light switches, and power plugs show up in the Lights + Power page, either individually or grouped together. 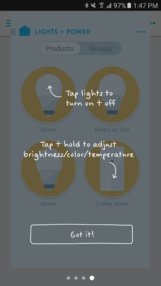 Simply tapping on an icon will tell Wink to switch its state from on to off (yellow becomes grey in the icon). 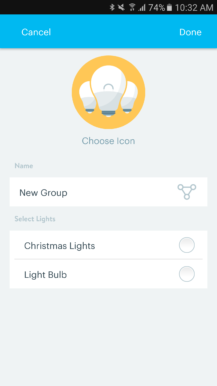 You can choose an icon, rename your lights, assign a location to them, and give access to other users to control them. 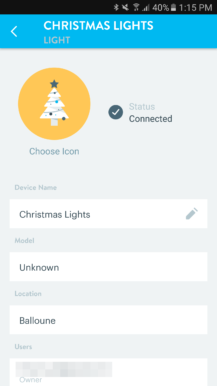 I used my Aeon Labs switch to plug in my pharmacy's Christmas tree lights, so I decided to name the switch as "Christmas Lights" and chose a nice tree icon for it. Cute. 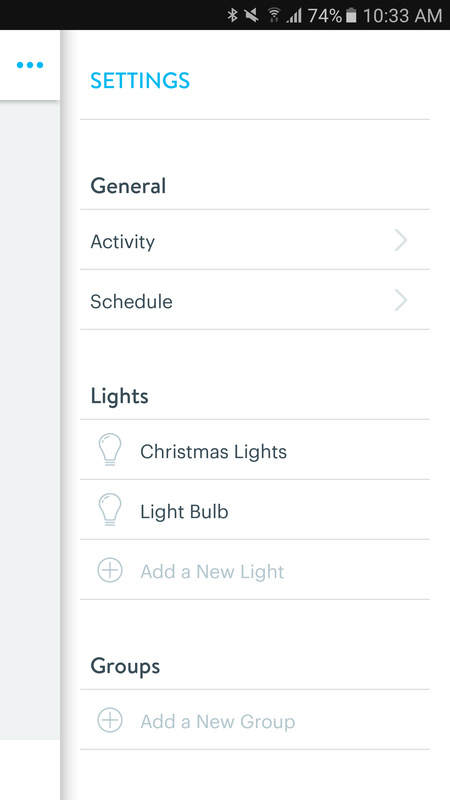 But not only is it visually appealing, it would make it easy to scan and find if my app had more lights added. 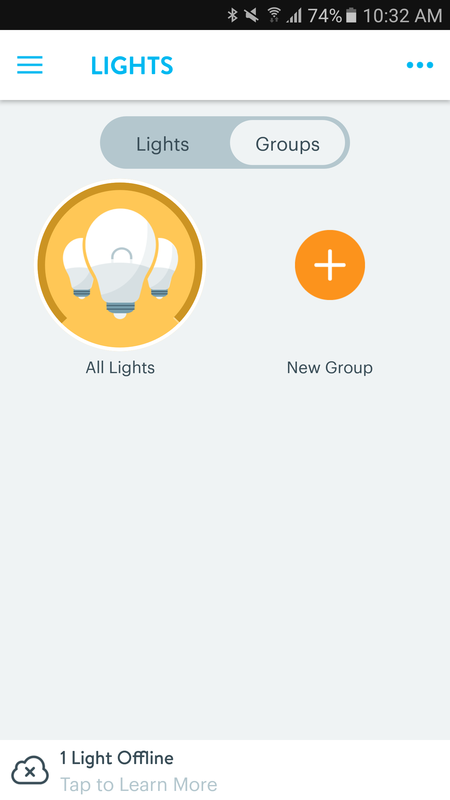 Groups let you toggle multiple lights on and off simultaneously. 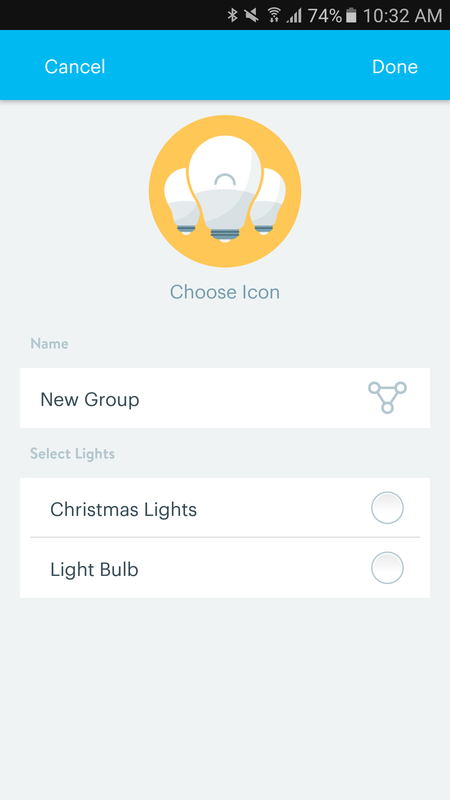 There's a default "All Lights" group but you can create more with any lamp, switch, or plug you have, and assign specific icons for them. 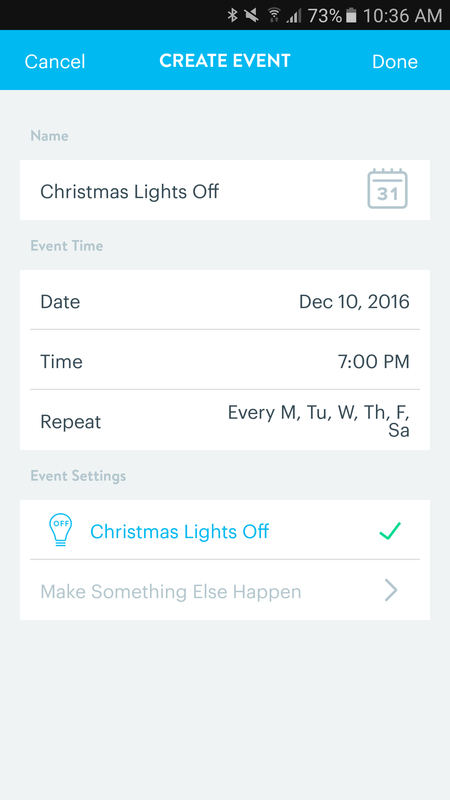 Like all devices on your Wink system, the overflow menu opens the right pane with your lights' activity, schedules, and settings. 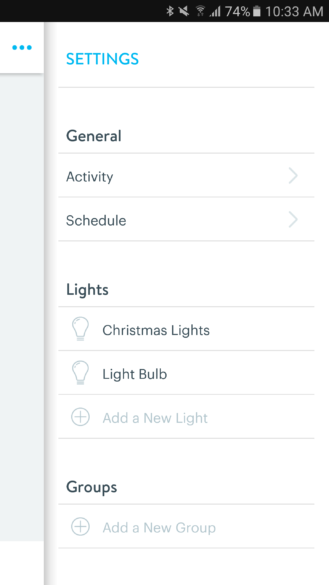 Lights + Power's side menu (left) and activity (right). I was having fun, sorry! 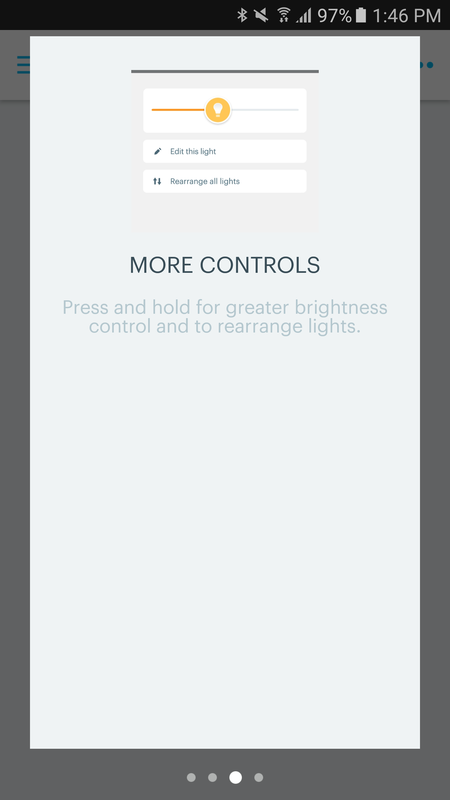 Like the different lights and switches, all your sensors are grouped under their eponymous tab. 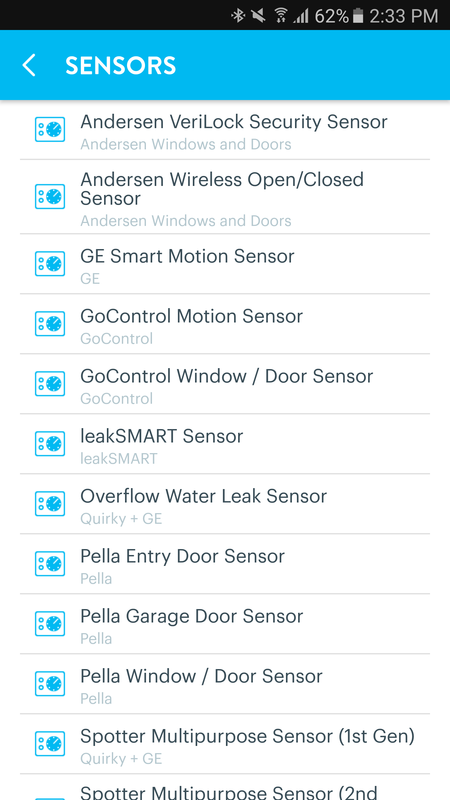 You can see the last state of each sensor in its corresponding icon, which - cutely enough - changes as well. Check that open door with a cat standing outside. 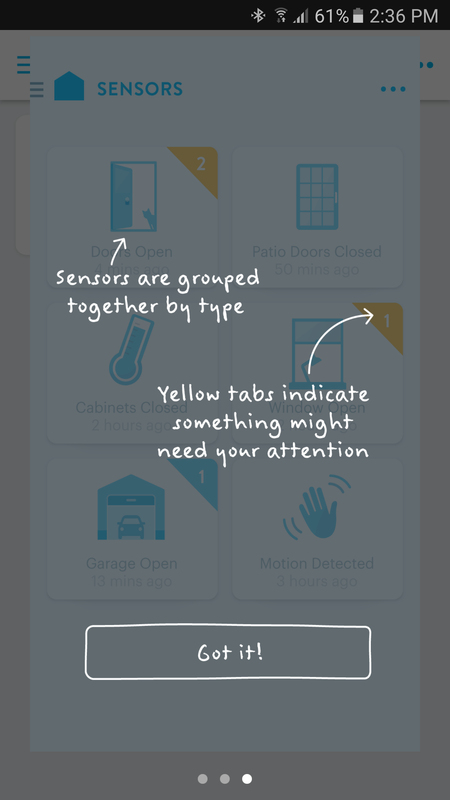 Again, as with all devices, the right side menu reveals the activity and settings of each sensor. 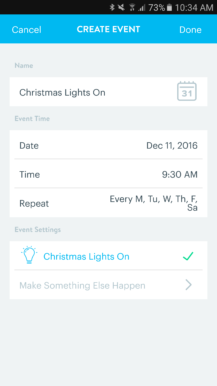 In this case, there's no access to schedules because you can't schedule a sensor to do anything. It's just a passive reporter on things that are happening. 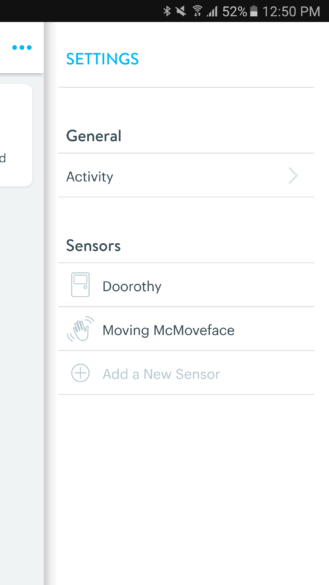 Sensors' menu doesn't have a Schedule option (left), but there's a detailed Activity screen (right). 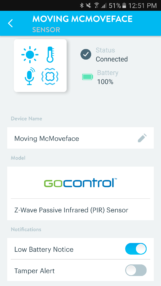 Each sensor has its specific settings page where you can check its connection and battery status, rename it, choose to get notifications on low battery or if someone tampers with it, assign it to a location, and give other users access to its data. 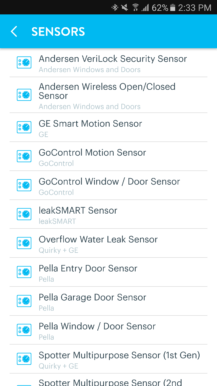 GoControl door sensor settings (left, middle left) and motion sensor settings (middle right, right). 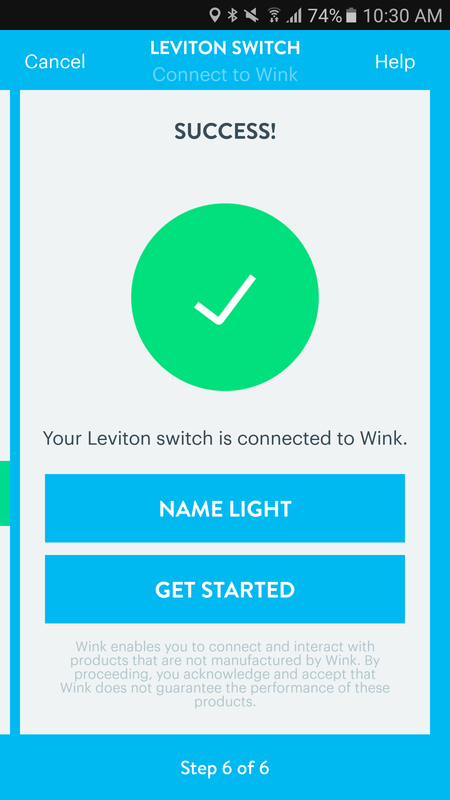 So far we've discussed everything you can see in the Wink app once you add your devices, plus all the manual switches you can tap to change a device's status. 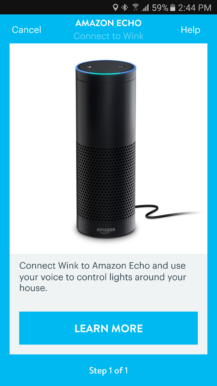 But that's not what the smart home is all about, is it? 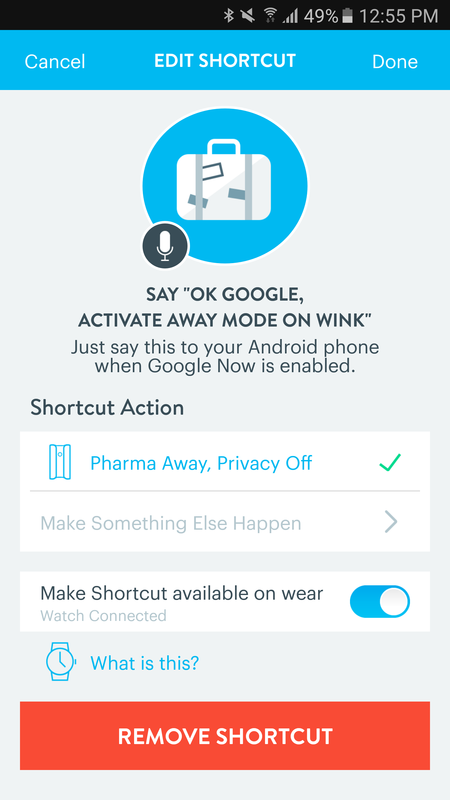 There should be automated things happening without your intervention and Wink lets you do that in one of three ways. 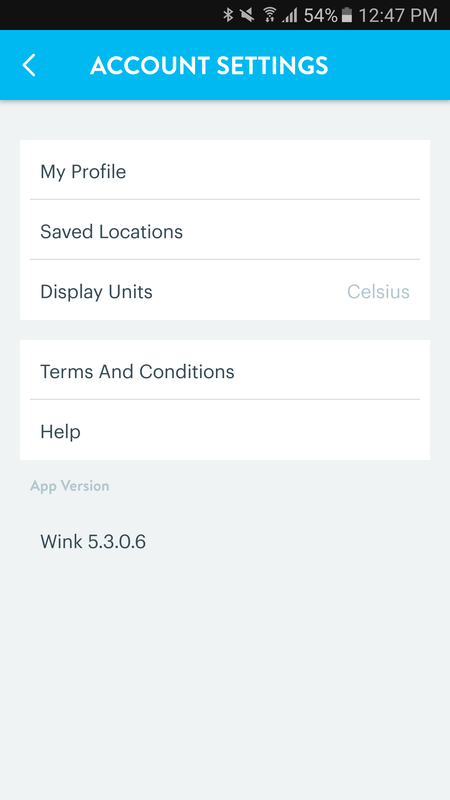 This is really where things might get confusing with the Wink app and system. Each device can be scheduled individually from the Schedule option you see in the right side menu (check Canary and Lights + Power above), but you can also create manual scenes (Shortcuts) and automatic ones (Robots). If you want something to happen based on time of day only, you have to use the schedules, but if you want something to happen based on a trigger or a location change, you will have to use the robots. Scenes can't be launched automatically, so if you're setting a night mode, you will have to manually trigger it via the app, Alexa, IFTTT, or some other means. You could create an automatic robot for things to happen at, but you'd have to find a specific trigger that always works, otherwise you'd either be launching night mode at unintended times or failing to do it when needed. 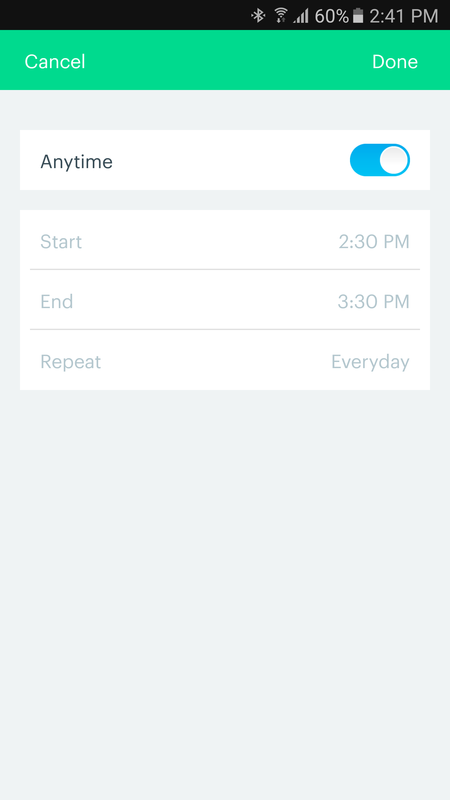 Choose the Schedule option from any device's right side overflow menu and you'll be taken to a screen that lets you change its state automatically any day, any time, and repeat that. 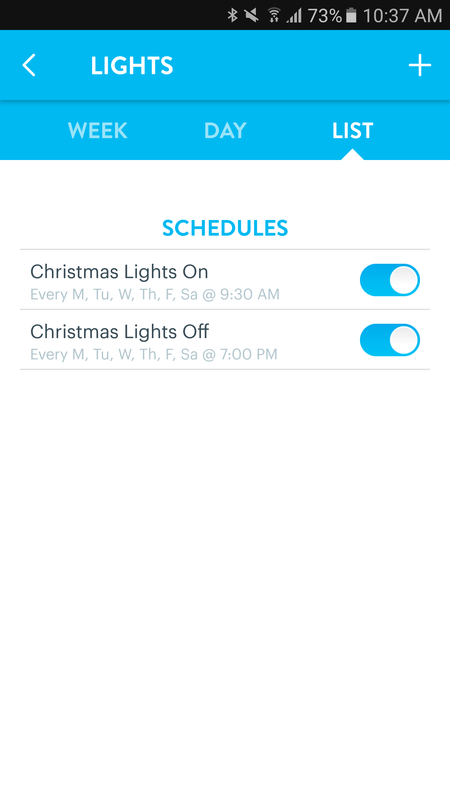 Since my pharmacy is open from 9:30 am to 7:00 pm each day except Sunday, I decided to start a schedule that would turn the Christmas tree lights on at 9:30 and then off at 7:00. 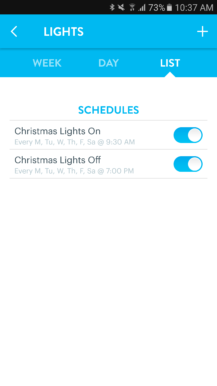 I could add many other lights to this schedule if needed. 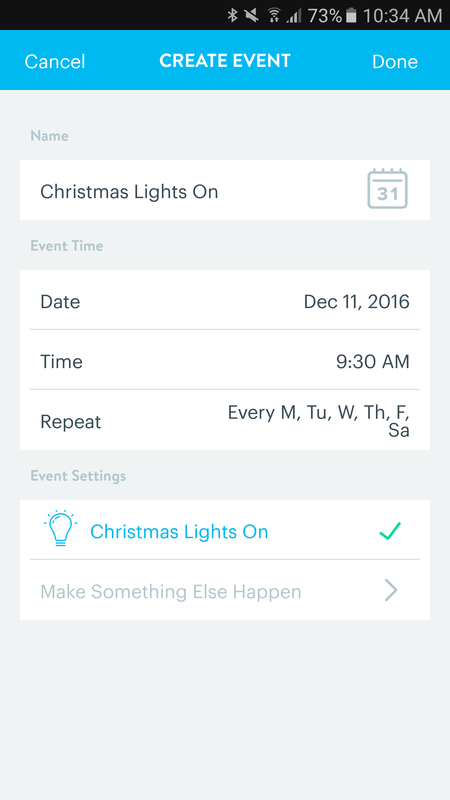 I could also choose one specific date for example where the lights would stay on the whole time, say December 24 and 25. 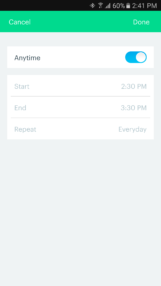 And schedules can be handily switched on and off without completely deleting them. 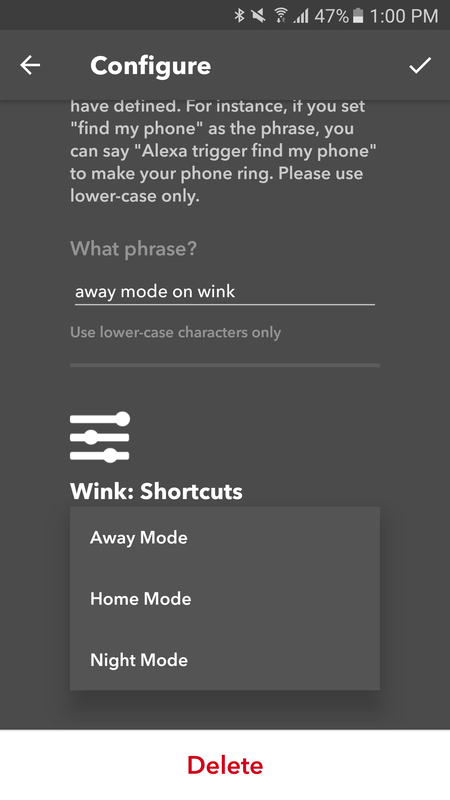 Shortcuts, the second tab in the Wink app's left menu, are manual scene modes. Tapping them simply triggers said mode. You can add as many actions to a scene, like lights turning on and off, cameras switching their modes, robots activating and deactivating, and more. 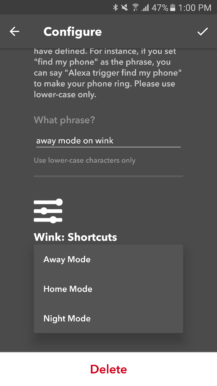 Wink's Shortcuts menu (left), creating a shortcut (middle), and OK Google doesn't work now (right). Unfortunately, the OK Google commands, which are heavily emphasized in the app when you create a shortcut, do not work now. I successfully tested them for several weeks from my phone before I even got the Wink Hub 2 (you can use the Wink app and connect it to Canary without having a hub), but they stopped working about two months ago and haven't been fixed since. 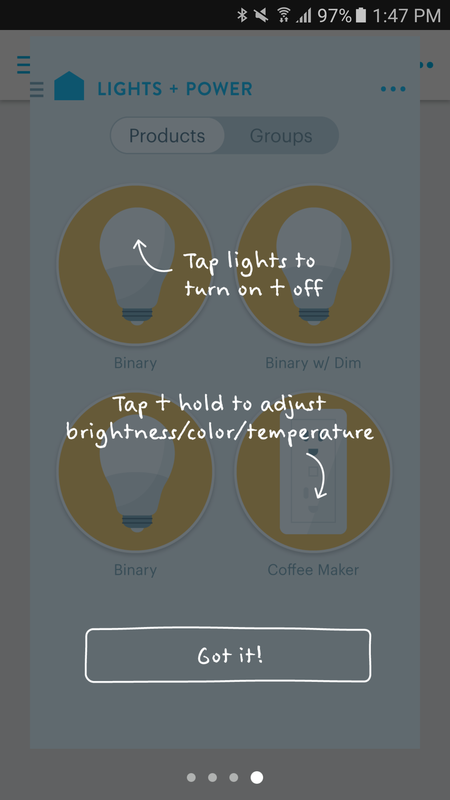 If you have a Google Home, you can use IFTTT as a middle-man to trigger these with Assistant, but it's still just a workaround. 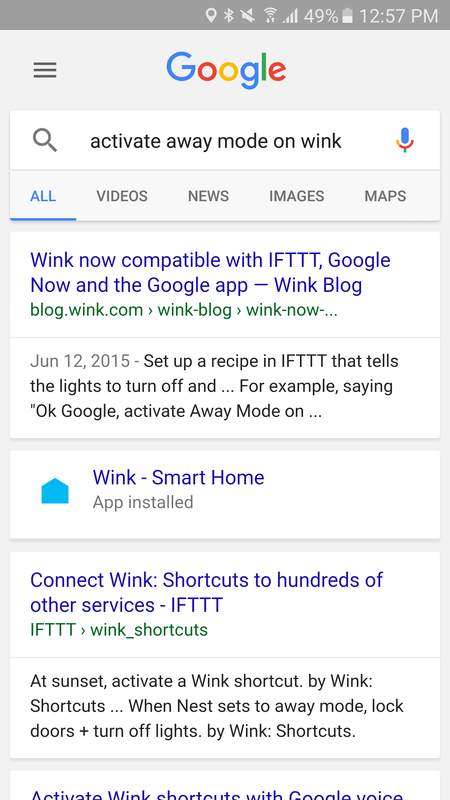 I hope the recently opened Actions on Google will be used by Wink to appropriately integrate the hub and its shortcuts with Assistant. 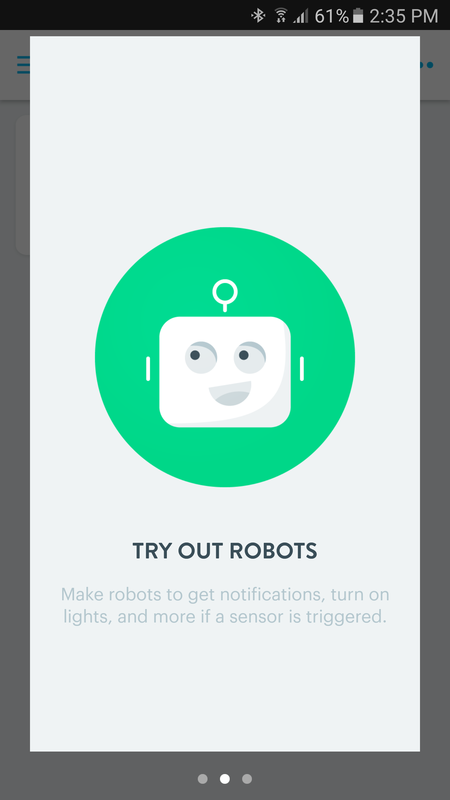 The third and most important way you can add automation to your Wink is with Robots. 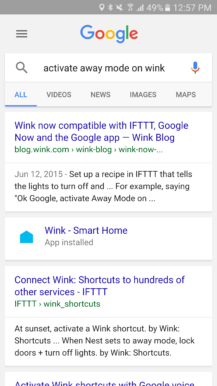 Think of these as more powerful IFTTT applets for your entire system. 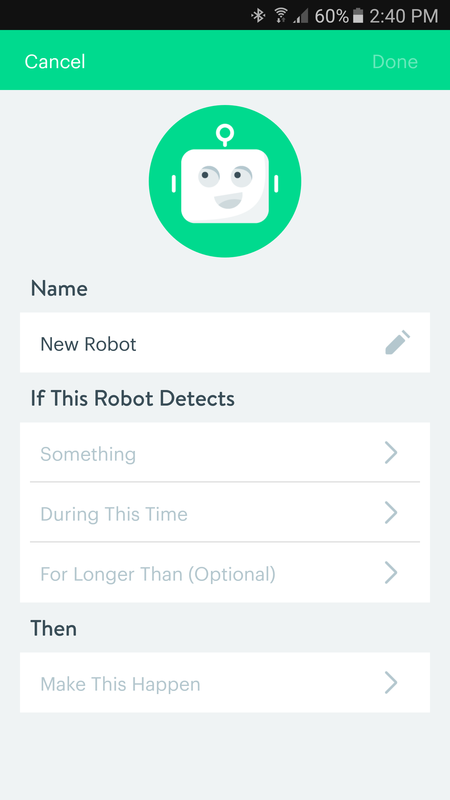 You can choose any trigger you want but limit it to certain times and days, specify how long you want it to be true before the robot executes its command, and choose as many actions as you want in answer to it. 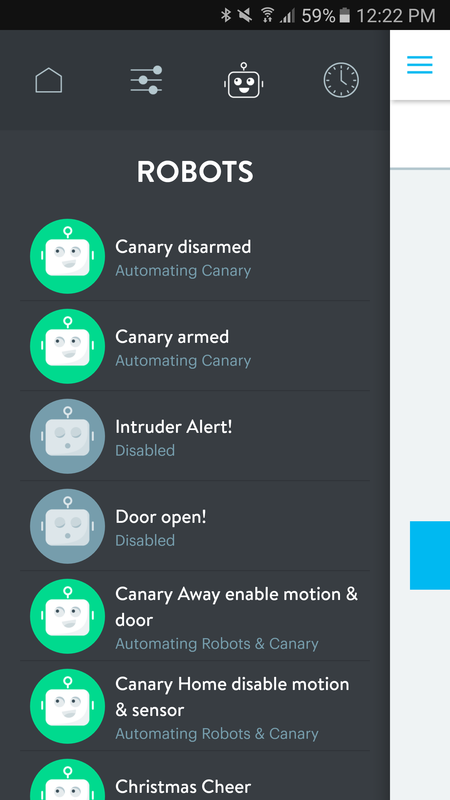 Below is a list of all my Wink robots (left), with two very simple robots I created to get a notification on my phone each time my Canary camera gets disarmed (middle) or armed (right). 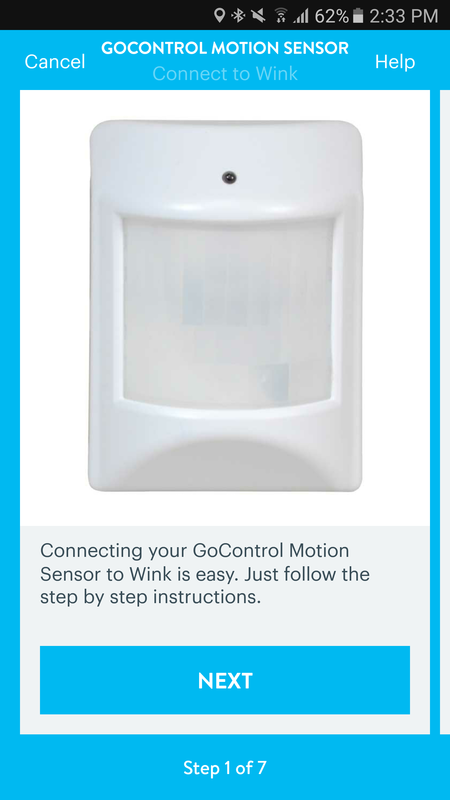 Since the Canary app doesn't notify me when the cam changes its state, I use these Wink robots to monitor how efficient Canary's system is at detecting my location and changing to away or home mode when I leave or enter the pharmacy's geofence, respectively. It's also a great way to spot any inconsistencies or unexpected changes in Canary's behavior, should they occur. 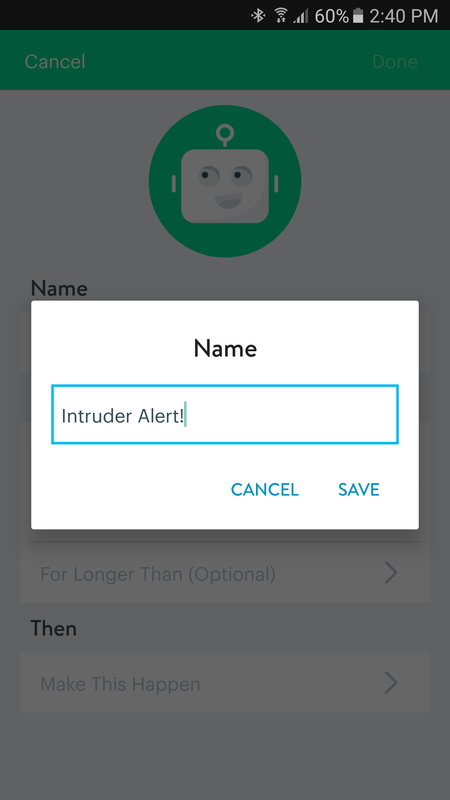 Since I have installed door and motion sensors in the pharmacy, I decided to use them to my advantage and get notified whenever they detected any activity. 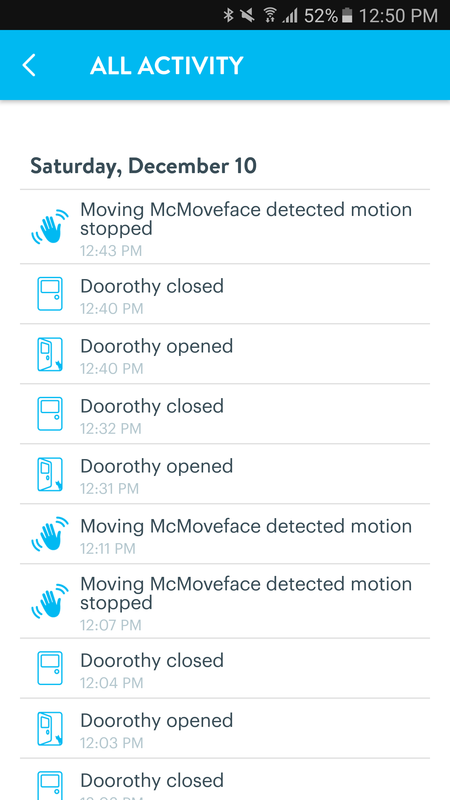 Below, you will see the different steps it takes to set up a motion sensor notification, from naming it, choosing one product and its trigger, specifying the time when it's active, how long it's active for, and the action that should be taken. 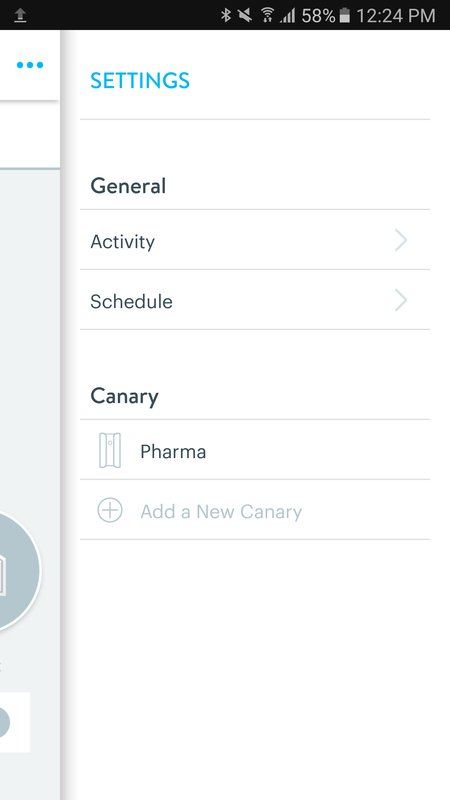 Basically, whenever I leave the pharmacy, I know that Canary will enter Away mode. 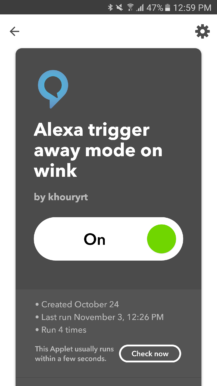 (I could use Wink's location as a trigger, but Canary follows multiple users' location, which is better for my home in the future.) 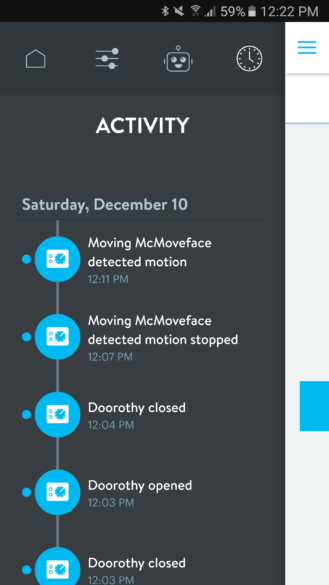 So when that happens and only if it happens between 6:55 pm and 10:00 am (remember, I close the pharmacy around 7pm and open it around 9:30am, but I'm not super timely about it), the robot I created above for Intruder Alert (notify me of a motion) and another robot for Door Open (notify me if the door opens) are enabled. I have a similar robot that disables the Intruder Alert and Door Open robots when Canary enters Home mode between 8:45 am and 9:00 pm. This means that my notification robots for the door and motion sensor are disabled whenever I'm at the pharmacy. They're also disabled when the pharmacy is open, even if I leave for a while or take off a little early, because they don't get triggered until closing time. 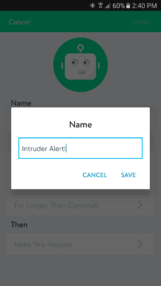 So my assistant can keep the pharmacy open and patients can come in and leave without me getting notified. The notification robots are, however, active during night time, which is when I want to know about any suspicious activity. Robots to control robots, but only in specific times and situations. And this is the result in my Wink's activity feed. 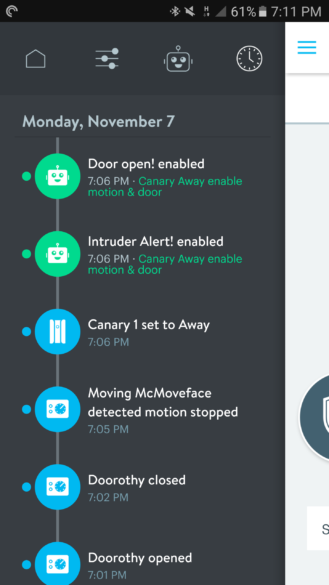 At 7pm, I opened the pharmacy's door to get out, closed it, the motion sensor stopped detecting motion, I drove away so Canary went to Away mode, and both Intruder Alert and Door open were enabled. 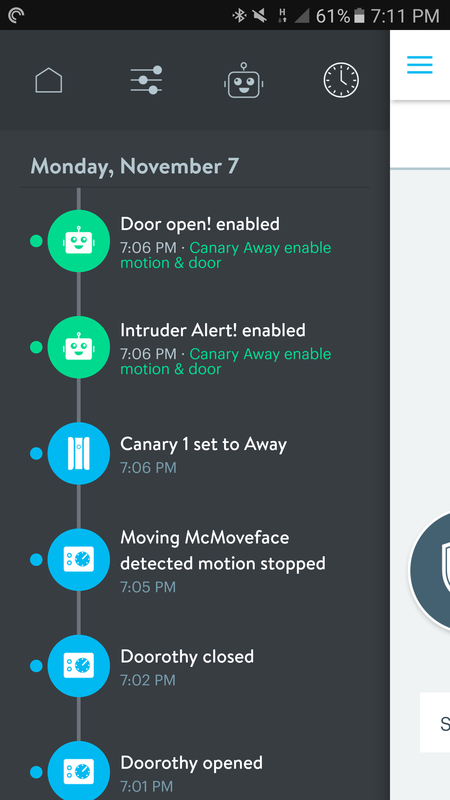 When I come back in the morning, Canary detects I'm near the pharmacy, sets to Home mode, and both Intruder Alert and Door open are disabled. 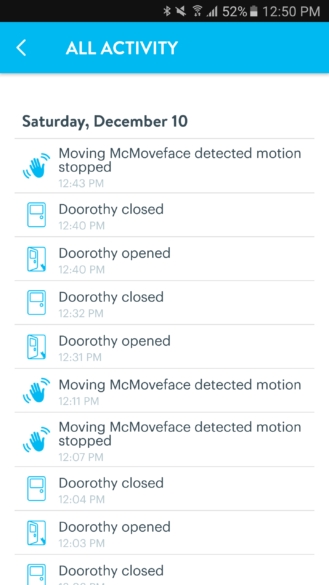 It's a little bit like magic, everything works in unison to create a security system that enables and disables itself without me tapping a single button. After setting the Christmas lights on a schedule, I thought that maybe keeping them on the entire day wasn't a very power-friendly thing to do. Since the pharmacy isn't always busy with patients, I decided to limit the cheerful spirit to only when customers come in. So I set up two robots: one that turns on the Christmas lights when the door is open, which is awesome because it greets me everyday in the morning when I open up the store, and one that turns off the lights 15 minutes after. 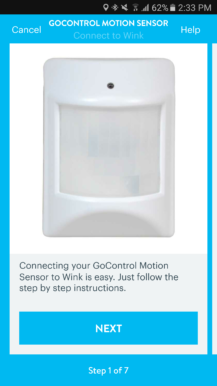 I wish Wink had a "pause" action so this would only need one robot: turn the lights on, wait 15 minutes, turn them off. But for now, two robots will have to do. 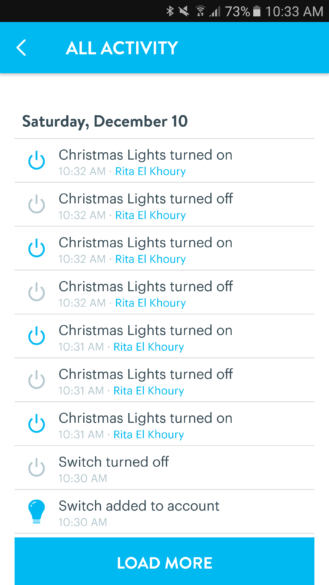 Power saving on the Christmas cheer. After a couple of months, I can safely say that my Wink experiment has been a success. Everything was easy to set up and despite the first struggles in trying to understand the different facets to its automation (robots, shortcuts, schedules), I now have a great grasp of how everything works and how to make "magic" happen without my intervention. 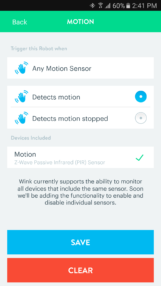 The Wink system has been rock solid since I first set it up, never disconnecting from any device, never missing a notification. 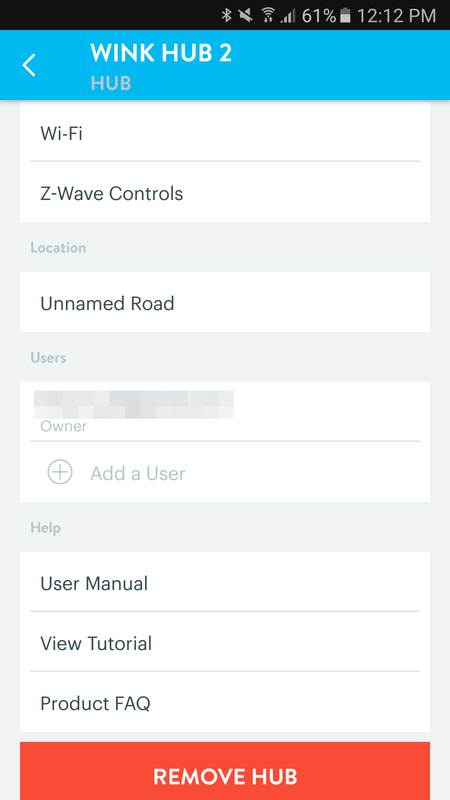 Honestly, I was expecting more issues based on some of the threads I've seen on Reddit, but I can't remember one instance where the Hub 2 let me down in two months. If I added more devices to my setup, maybe some issues would arise. But I can't say for sure. I'm more inclined to think that satisfied users are less likely to be vocal, so issues are disproportionately represented online. 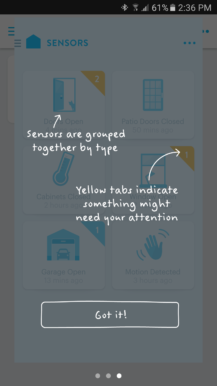 And therein lies the dilemma with home automation: it's fun, addictive, with endless possibilities, but it's also expensive and relies on disparate systems and protocols that don't often work together or don't work at all in your country and with your home's setup. 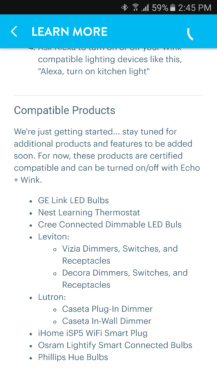 If you live in the US, some of these issues are nonexistent because unlike me, you won't have to worry about wiring, voltage, plug types, switch shapes, lamp sizes, Z-Wave frequencies, and, if I'm being bluntly honest, you won't have to add all the shipping expenses to get anything over to the other side of the planet. 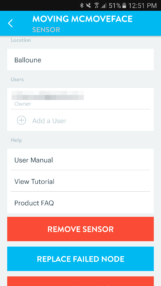 But you will have to consider security, usability, integrations with your other products, and the viability of anything you buy. It's a bit overwhelming, no matter how you slice and dice it. 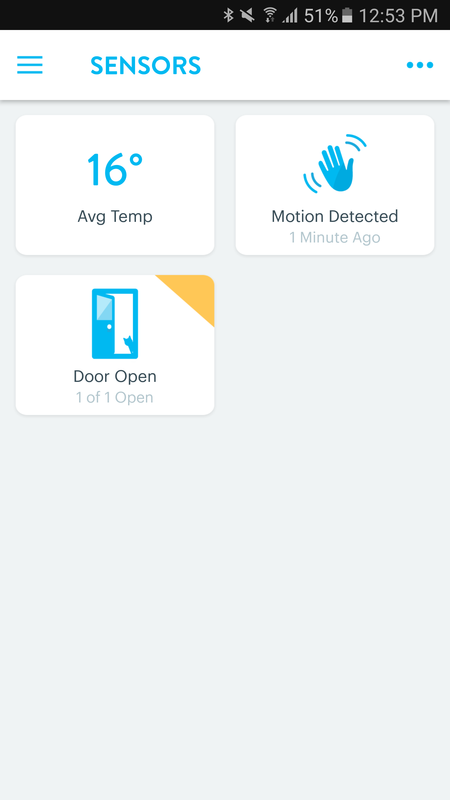 I can't end this review without mentioning a few words about the elephant in the room, Wink's competitor, SmartThings. I have read a lot about it, but I kept having the impression that although it was more powerful (organize products by rooms, multi-user support, writing your own code, adding products that aren't officially supported, etc), it was also more complicated and less inviting. I'm sure I will try it at one point, but I may wait until whenever the V3 hub is released. 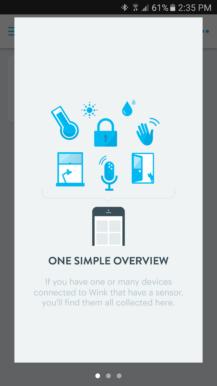 For a first dip into home automation or anyone who just wants to get things that work together without too much hassle, I think that Wink has a very interesting proposition thanks to its simple setup, multiple wireless protocol support, powerful app and automations, and most importantly, its superb integration with third-party products from online documentation to in-app tutorials and support to endearingly accurate graphics that make things seem more approachable for everyone.